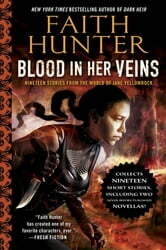 Nineteen fabulous tales that fans of Jane Yellowrock must read. If you are like me, then you can’t get enough of Jane Yellowrock, the tough, take no nonsense skinwalker that shifts into Beast, the cat with attitude. In every story she plows through obstacles to achieve whatever job she is on, to save whichever person needs saving or just taking care of business and in the case of Blood in Her Veins readers get a compilation of stories in Jane’s world where some are from her perspective and some are from others’ perspectives which gives readers a bit of insight on how other characters see our beloved heroine. All of the characters in the series are strong, captivating and demand reader’s attention, not as much as Jane of course but hey she is the main focus of the series and the stories in this book are all fast paced and flow smoothly ensuring that readers get all the thrills and chills along with the suspense, excitement and touches of romance. Lots of spine tingling tension builds throughout the stories, ensnaring the readers and refusing to let go with lots of dangerous excitement as Jane faces some serious foes and cheerful excitement as she meets new people and makes new friends and allies. The stories are well written with vivid details that capture the imagination and bring the stories to life and are a well-rounded overall look at the series that really gives the readers insight into the various characters and nuances of Jane’s life and her abilities. And of course the readers don’t want to miss the two never before published stories “Cat Fight” and “Bound No More” which are thrilling additions to the series. Some stories are shorter than others but I had so much fun jumping around Jane’s world as I read the stories that I couldn’t quit reading until I had them all. A Jane Yellowrock Must Have! First, I love having all the shorts and back stories in one place! Second, the two new novellas left me speechless! In Cat Fight, Jane heads back to take care of some Cajun vamps and witches. Jane learns something new about one of the Nolo vamps that raises some interesting questions. In Bound No More, Jane has company. Molly and Angie Baby are in town. Some things Angie Baby has kept secret come out, and we see another side to the Kid. You won't be disappointed! A Wonderful Romp Through Jane's World! All the short stories in this collection are by Faith Hunter and are about the Jane Yellowrock world as seen by her and many other characters who play large parts in the book stories. There are 19 stories in all, some that are first time in print, having been released as audio specials and two all new (substantial) novellas. Now all in ONE book (super!). It's impossible to briefly review all the stories individually here, but I'll reflect on the two new novellas to give you a taste of what's in this book. In "Bound No More" Molly and a very precocious Angelina visit Jane when Angelina is caught literally "red handed" trying to steal one of Jane's magical artifacts from a closet. Talk about surprising! Just beginning to try and decide how to handle a child who is way more powerful than her age and wisdom can manage properly, a young arcenciel begins to attack Jane's house looking for the same artifact! What to do with all this going on? You'll have to read the story to see how Jane, Molly and the Younger brothers help out with this mess! "Cat Fight" is one of my favorite stories in this collection, and is one of the new novellas written especially for the book. Jane and the Younger brothers are "ordered" to Bayou Oiseau in response to a request for her assistance in that community on a matter that apparently has the witches, humans and vamps back at each other's throats (pardon the pun). The young vamp/witch couple that Jane had seen married to each other on her prior visit to settle all out war between the residents, are at the heart of this melee as well as a new magical artifact the witches and vamps are fighting over. All heck breaks loose at the bayou! During this trip, Leo, Master of the City of New Orleans INSISTS that Jane take along a vampire (no reason given) called Edmund Hartley - who, though uninvited by Jane and her team, proves to be extremely surprising in his skills and abilities! I see a bigger role for Edmund in the future! You have GOT to read the stories in this book, not just the two new ones. The short stories round out or fill in the gaps between the book stories and give much appreciated insight into why secondary characters are the way they are, why they relate with Jane the way they do, and even information important to future books. Read it!